The success of Elijah Fletcher's farm relied on the labor of enslaved individuals, both African American and Native American (from the nearby Monacan Confederacy). Although initially opposed to the "peculiar institution," Elijah owned over 110 slaves upon his death in 1858. Shown at right is a rare, undated (but almost certainly post-bellum) photograph of one of the former slaves, Martha Penn Taylor. In 1865, the slaves were freed, but some families settled nearby and continued to work for the Fletchers as paid laborers. Martha (see at the right), for example, moved to nearby Coolwell and became a nursemaid for Daisy (Indiana's only daughter). For updates on research into the African Americans who lived and worked at Sweet Briar, click here. To read about African American heritage at Sweet Briar, click here (the pdf file is 1.2 MB). 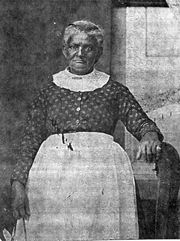 Martha Penn Taylor, enslaved by Elijah Fletcher in the 1850s. Emancipated. Worked as a nursemaid for Daisy Williams until the girl's death in 1884. Undated photograph. Sweet Briar Museum Collection.